Divock Origi emerged from the bench to be the toast of the red half of Merseyside as Liverpool beat Everton 1-0 at Anfield on Sunday. The Belgium international struck a stoppage-time winner in front of the Kop as the Reds edged a tight, tense clash with their neighbours. Pure unadulterated joy. Anfield folklore has a new chapter after the most dramatic of finales to the 232nd Merseyside derby. Liverpool have inflicted plenty of body blows to Everton over the years but few quite as devastating as this one. There just isn't a better way to beat the Blues. The defining moment in the sixth minute of stoppage time was glorious and farcical in equal measure. Virgil van Dijk's looping volley looked harmless but Jordan Pickford made an absolute hash of it as England's No 1 flapped and turned the ball on to the bar. Substitute Divock Origi pounced and gleefully accepted the gift as he nodded home the rebound to become the most unlikely of derby heroes. Cue mayhem. Absolute mayhem. Anfield was engulfed by ecstasy. Origi's name echoed around Anfield as the wild celebrations continued long after the final whistle. The Belgium striker will never have to buy another orange juice on Merseyside again. How fitting that he should announce his return to the big stage against the Blues. His career has gone downhill since he was chopped down in his prime by Ramiro Funes Mori's X-rated challenge in this fixture two-and-a-half years ago and hopefully this will prove to be a turning point for him. Liverpool are now unbeaten in 18 successive derbies and Everton's wait for a first win at Anfield this century continues. But this was about so much more than local pride. Victory ensured that the Reds kept their Premier League title challenge on track by closing to within two points of Manchester City. A ninth clean sheet in 14 league games extends the best start to a campaign defensively in the club's 126-year history. The Liver Building may be blue but the dominant force on Merseyside remains well and truly red. Few supporters know how cruel football can be as well as those of Everton. For 20 years, followers of the Toffees have been heading to Anfield watching their team repeatedly fail to get one over on their closest rivals. But few Merseyside derby defeats can have hurt as much as this one, given the circumstances in which it came about. Marco Silva’s men had been bold and impressive, and were seconds away from claiming a point that was arguably no less than they had deserved. They may still be top of the Premier League with a two-point cushion, but Manchester City must surely be getting sick of having Liverpool on their shoulder. Up against one of the best-equipped squads ever assembled, Klopp and co can only keep winning their games and hope a surprise slip-up can take them top. Could Origi be about to pull off one of the great Anfield comebacks? Having impressed in training and rewarded Klopp’s faith in dramatic fashion today, he suddenly looks to have put himself forward as a striking option for the Reds again. The contrast could not have been greater, the hero more unlikely. As Pickford, ashen-faced, mortified, barely-believing, offered an apologetic hand to the devastated Evertonians packed inside the Anfield Road end, the rest of this famous old stadium paid tribute to its matchwinner. “Divock Origi!” rang the chant from the Kop. It’s been a long time since that was heard, eh? A typical Klopp win, you could say; dramatic, thrilling, emotional. 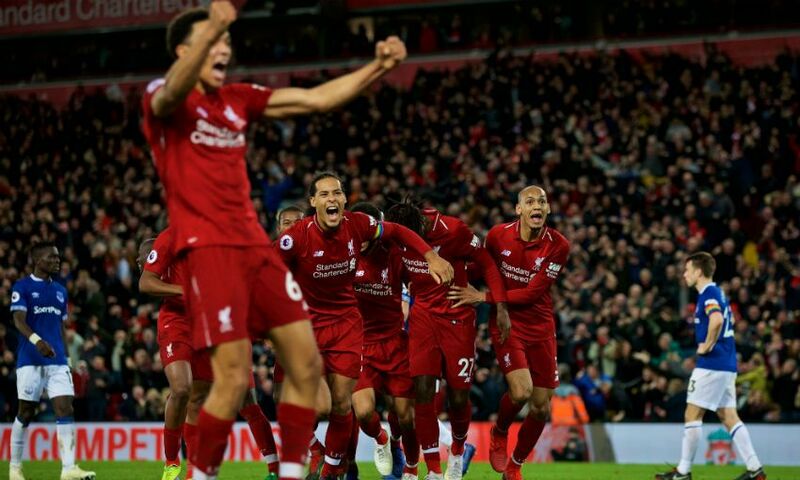 The short and the long of it is as follows; the win extends the Reds’ unbeaten start to the Premier League season to 14 games, and keeps them just two points behind Manchester City at the top of the table. As three points go, these were precious. But days like this are about more than three points. We know that. Klopp knows that. Those who came clad in red and blue know that. How this will hurt Everton, whose wait for a Merseyside derby victory goes on. It’s a record 16 games now; they haven’t won at Anfield since 1999. Liverpool, meanwhile, bounced back from their midweek humbling in Paris to record this most precious of victories. The Reds are still short of fluency, but not heart. Klopp’s men were rewarded for their perseverance here, albeit in the most bizarre of fashions. What do they say; sometimes it's better to be lucky than good. Pickford held up his hands in apology to the aghast away section after gifting the 232nd Merseyside derby to Liverpool. Other Everton players lay on the pitch, stared into the middle distance or, in the case of Lucas Digne, stormed down the tunnel pushing aside every offer of consolation as he went. Liverpool’s 96th-minute winning goal had been freakish but the outcome, the pain and regret, were all-too familiar for their Merseyside rivals. Anfield remains Everton’s venue of nightmares. This was, as Klopp had predicted, the Liverpool manager’s toughest assignment in a Merseyside derby and far removed from his first experience, when a 4-0 defeat of Roberto Martínez’s shambolic Everton side left him bemoaning a second half that was “no real fight any more”. This was a fight from the first minute to the 96th, when the England goalkeeper pawed a Virgil van Dijk miscue that was sailing out of play back on to his crossbar and on to the head of the grateful Divock Origi. He duly nodded home to send Liverpool back to within two points of Manchester City and their local rivals into despair. The last time Everton savoured a win in these quarters was in 1999. With errors of this magnitude and gilt-edged chances squandered, the drought seems less surprising by the year.